A car drives through a devastated part of the old city of Homs, Syria, Jan. 16, 2018. In the Syrian city of Homs' landmark Clock Square, where some of the first anti-government protests erupted in 2011, stands a giant poster of a smiling President Bashar Assad waving his right arm, with a caption that reads: "Together we will rebuild." Four years after the military brought most of the city back under Assad's control, the government is launching its first big reconstruction effort in Homs, planning to erect hundreds of apartment buildings in three neighborhoods in the devastated center of the city. It is a small start to a massive task of rebuilding Syria, where seven years of war, airstrikes and barrel bombs have left entire cities and infrastructure a landscape of rubble. The government estimates reconstruction will cost some $200 billion and last 15 years. As in neighboring Iraq, which faces a similar swath of destruction after the war against the Islamic State group, no one is offering much to help fund the process. Moreover, destruction is still being wreaked. For the past 10 days, government forces have been relentlessly bombarding eastern Ghouta, a collection of towns on Damascus' edge in an all-out push to crush rebels there.Hundreds have been killed and even more buildings have been blasted to rubble in a community already left a wasteland by years of siege. In this photo released on Feb. 20, 2018 provided by the Syrian Civil Defense group known as the White Helmets, shows members of the Syrian Civil Defense extinguishing a store during airstrikes and shelling by Syrian government forces, in Ghouta, a suburb of Damascus. ​At the same time, only 10 kilometers (6 miles) away on the other side of Damascus, government workers have begun clearing rubble from Daraya, another suburb wrecked by a long siege, to begin reconstruction. The question of who will rebuild Syria has become part of the tug of war between Assad and his opponents. The government can cover $8 billion to $13 billion of the reconstruction costs, according to the Cabinet's economic adviser, Abdul-Qadir Azzouz. 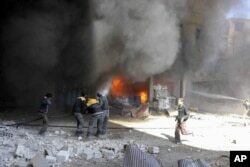 So Damascus says it will need the international community. But it also says only those who "stood by" Syria will be allowed to participate, a reference to staunch allies Russia and Iran. That likely means lucrative rebuilding contracts will be handed to private companies from those countries, as well as probably China. The international community, in turn, faces a dilemma. It wants to stabilize Syria to allow for millions of refugees to return - the longer it takes, the less likely it becomes that they will go back. But any support for reconstruction in Syria would buttress Assad and be seen as contributing to the normalization and legitimization of his government. Oil-rich Saudi Arabia, for instance, is unlikely to put money in a country that is backed by its regional archrival, Iran. "There is little chance that any reconstruction process will happen unless a comprehensive political deal is reached, which is itself very unlikely," wrote Jihad Yazigi in Syria Deeply recently." The countries and institutions that have the money and which traditionally fund such large-scale financial efforts, namely the Gulf countries, the European Union, the United States and, through it, the World Bank, have, indeed, lost the Syrian war." American officials say the U.S. will not work with Assad's government, whose leadership they describe as illegitimate. "Until there is a credible political process that can lead to a government chosen by the Syrian people - without Assad at its helm - the United States and our allies will withhold reconstruction assistance to regime-held areas," acting Assistant Secretary of State David Satterfield told the Senate Foreign Relations Committee last month. Even Assad's allies Russia and Iran are too cash-strapped to fund a massive rebuilding. China's special envoy on Syria, Xie Xiaoyan, sounded a note of caution not to expect his country to carry the burden. "The tasks ahead are daunting," he said during a round of the Geneva peace talks in December. "A few countries cannot undertake all the projects. It needs a concerted effort by the international community." Meanwhile, tens of thousands of square miles remain a pile of bombed-out buildings and wreckage. Recent Associated Press drone footage from Daraya outside Damascus and the city of Aleppo in the north shows scenes of destruction reminiscent of World War II devastation. East Aleppo, home to nearly 1.5 million before the war, is still largely empty and in ruins a year after it was recaptured from rebels. Small-scale renovation of government buildings and historical sites has barely begun to scratch the surface. In eastern Ghouta - an area with a pre-war population of some 400,000 - the United Nations did an assessment of satellite imagery from six of its seven districts and found more than 6,600 damaged buildings, more than 1,100 of which were totally destroyed. And that was before the latest government offensive, which has leveled even more homes and structures. For reconstruction overall, the Syrian government is trying to scrape together financing from Syrian businessmen and expatriates as well as international allies. It has imposed a 0.5 percent reconstruction tax on some items, including restaurant bills. A family that returned to live in their apartment inside a heavily damaged building hang their clothes on a balcony in the Bab Dreib neighborhood of Homs, Syria, Jan. 17, 2018. The Homs project gives an indication of the scale of the task. The plan, to begin later this year, focuses on three of the city's most destroyed districts - Baba Amr, Sultanieh and Jobar - and will rebuild 465 buildings, able to house 75,000 people, at a cost of $4 billion, according to Homs' governor, Talal al-Barrazi. It was not immediately clear how many housing units that entails - meaning individual apartments - but assuming there is on average five people per household, that would be around 15,000 units. That's under half of the 35,000 housing units that were estimated to have been destroyed in Homs. And it's a small fraction of the one million housing units al-Barrazi said Syria will need. Homs saw some of the worst destruction of the war as government forces for months blasted the string of neighborhoods in the city's center that were held by rebels. The military retook almost all the city in the spring of 2014 but one rebel-held district, al-Waer, held out under siege until last year. For the past four years, any rebuilding has largely been the work of individuals, with some help from the U.N. In the devastated Khaldiyeh district, carpenters were fixing the windows and doors of Mohammed Bayraqdar's charred apartment. The walls inside - even the chandeliers - were still blackened from the fighting years ago. Mohammed Bayraqdar removes broken window glass at his burned house in Khaldiyeh, one of the worst damaged neighborhoods in Homs, Syria, Jan. 17, 2018. The 38-year-old coffee vendor fled Khaldiyeh in 2011 and moved to his in-laws in a government-controlled part of the city. Late last year he informed the municipality that he wanted to return home. Once government architects checked that the building is suitable for living, repair work began with the help of a U.N. rebuilding program. "Everyone should return to his home, even if it means living in one room only," said Bayraqdar, standing on the roof overlooking a vista of flattened buildings. Assad's government controls more than half of Syria, including the largest cities and main population centers. Other than pockets still under rebel control, most of the rest of Syria is in the hands of U.S.-backed Kurdish-led forces that wrested territory in the north and east from the Islamic State group, including the militants' former de facto capital, Raqqa. The Kurds have done some rebuilding, particularly in Kobani, a Kurdish-majority border town. Soon after Sunni Arab-majority Raqqa was freed from IS, a Saudi minister visited the city and promised the kingdom would play a role in rebuilding it, though no specific projects have been announced since. According to U.N. assessments, more than half the buildings are damaged in 16 of Raqqa's 24 districts. FILE - Syrian citizens carry their belonging as they prepare to evacuate from Daraya, a blockaded Damascus suburb, Aug. 26, 2016. Outside Damascus, Daraya was left an empty ruin after all its population was removed in a deal last year that ended a destructive and grueling siege by Assad's military. The suburb once had a population of 300,000 and was famous for its furniture, textiles, wood and vineyards, which produced some of Syria's best grapes. 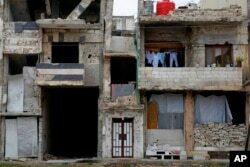 "Almost all houses, factories, stores in Daraya remain skeletons," said Daraya's mayor, Marwan Obeid. He estimated rebuilding infrastructure alone will cost $160 million to $200 million. The government has so far allocated $70 million. 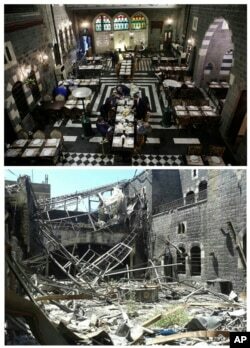 This combo of two photographs shows an undated handout photo, bottom, of the destruction at the Julia Palace Resautrant, and the same spot after the reconstruction on Jan. 17, 2018, top, in Homs, Syria. The plan, he said, is to start move some 100,000 people back into the less damaged half of Daraya, which inspectors estimate can accommodate some 100,000 people. The rest of the community, however, is too ruined. Obeid said it was not known how long that will take to rebuild. In central Homs, Malek Traboulsi and his partner paid nearly $400,000 - even selling off their wives' jewelry - to renovate their restaurant, Julia Palace, which suffered major damage in the war. It re-opened on Christmas Day 2016. Some people warned him he was investing in the unknown. But Traboulsi said he could never bear to sell off his property and leave Syria. "This is my country," he said on a recent evening as he moved among the tables chatting with customers. "Here is where I breathe, here is my life and I cannot live in any other place."